I'm often telling people how great it is to work here, because... well... it is. Today I was talking to a candidate on the phone, having a nice conversation, and I realized that I was staring at my slippered feet, propped up on my desk... and I was like... hey! What says "amazing place to work" better than warm feet? I know. It sounds sort of silly. But then... it's really not silly at all. It's amazing. I've worked at a lot of places over the years, and I don't know about you, but I often find the concrete floors of many office buildings to be particularly cold during the winter months, and the soles of my shoes seem to wick that coldness right up into my feet. I hate it. Last year I was sitting at work thinking to myself about how unpleasant it was to have cold feet and it dawned on me... I work at iuvo Technologies. I can wear slippers! So I bought a pair! And oh my gosh, are they ever glorious. And no, obviously I'm not going to show up to one of my clients wearing slippers, but there's absolutely nothing wrong with dressing down a bit and being comfortable when you're planning to be in the office for the day. It makes me happy, which makes me more relaxed, which makes me more productive. Everyone wins! 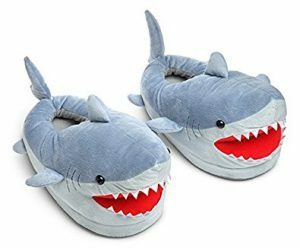 Of course, the problem with this little revelation of mine is that it has now occurred to me that I should really go all-out and get something super cool, like maybe shark slippers! Oh, and yes, for those paying attention, that is the Bumble and Yukon Cornelius from the Rank and Bass production of Rudolph the Red Nose Reindeer. I love having my various favorite holiday decorations at work, too. Just more reasons to smile.